Passing Games | Musings of a far off NASCAR and NFL card collector…. For those who didn’t want to watch the video. Here’s a close up look at the cards from out Topps Five Star break. We hadn’t tried breaking a box of “High End” NFL, so figured we were about due. Having always preferred Five Star over National Treasures for some reason, we decided to do a break of the 2013 product. We pulled a Five Star Futures 4 piece Autographed booklet card of Kenny Stills, numbered 2/38 (There’s that odd numbering again) The disappointing thing with this card is that there are four pieces of Relic/Jersey on this card, and all four are black. Surely for a high end product like this, Topps could have found some different color swatches to use ? Away Jerseys ? A piece of gold number perhaps? And Kenny, how about signing more than just “KS” ? These on card Auto’s do look very nice. 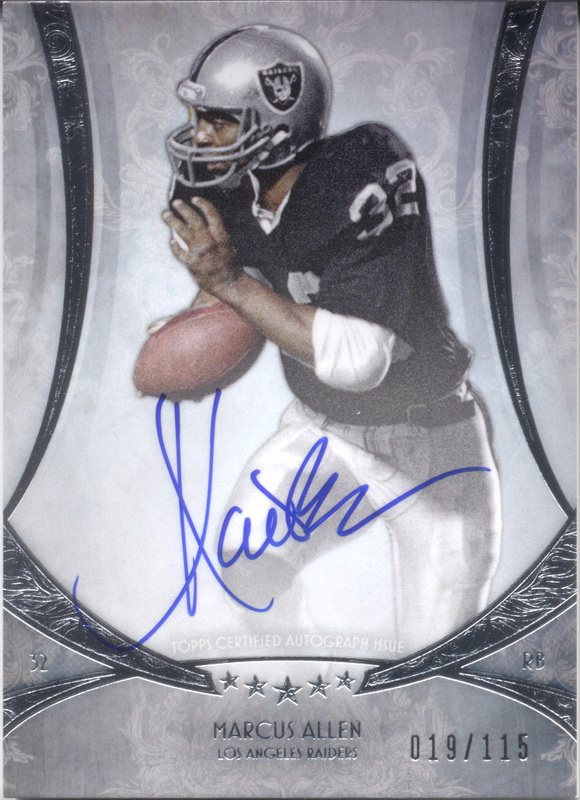 While getting Kniles Davis (/130), who obviously went to Kenny Still’s autograph school, was a little disappointing, pulling a Marcus Allen autograph (/118) was a nice return to the early days when we first started watching the NFL. He was a great player, and I think of him more as a Raider than a Chief, so good to see him in the Silver and Black. *Well technically we did get one, but it’s in that dreaded form of a Redemption. 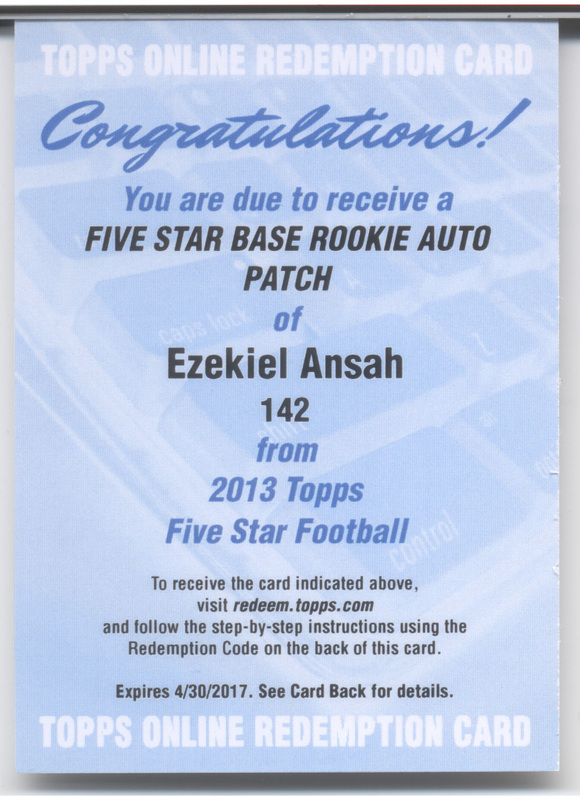 It’s for a Five Star Rookie Auto Patch of Ezekiel Ansah. Topps are good with redemptions if they have the cards, but if they don’t, they are terrible with updating and in looking after their customers. We’ve had book cards relaced with single autos and we still have 5 James Laurinaitus 2013 Finest redemptions (all from one case – great collation Topps!) that have had no action since early 2013! Yet there are examples of the cards on Ebay – What gives Topps ?? Nice colors on the /25 Mike Glennon patch. But these days with the disclaimer on the back – who knows where or what it’s from ? Does it have any association with Glennon, or is it just something Topps chopped up to put in cards ? Sometimes I think we collectors are well and truly being had these days. 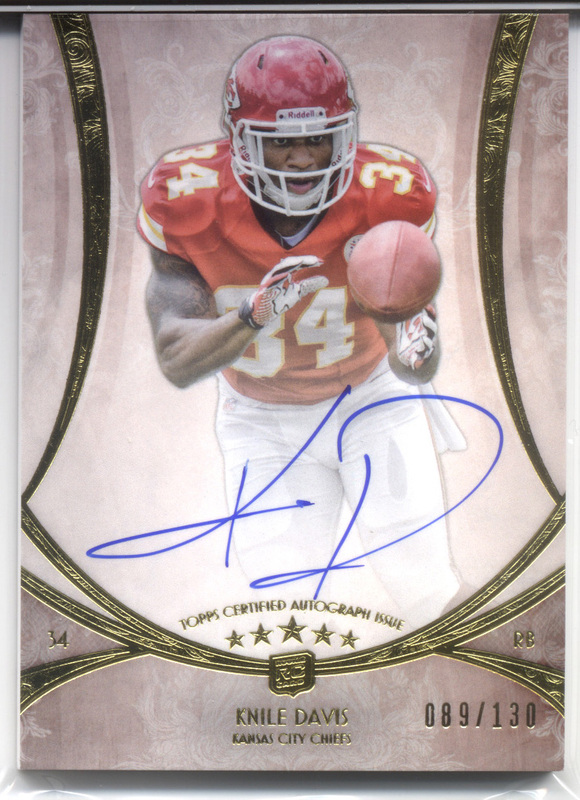 2013 Topps Five Star is a nice product. At the current prices (about $280) get the right box and you’ll be happy. Get a mediocre box like ours, and you probably won’t be. For a product of this price, I think a lot more effort needs to go into the booklets especially. Four swatches, all single color and all the same color just shouldn’t happen in a product of this calibre. Welcome back ! We apologise for the break in transmission. Life gets in the way sometimes. But lets see if we can’t get things going here again. What you’ll get – 5 Cards. 1 booklet Autograph/Memorabilia card /15 or less. 1 Autograph memorabilia card /50 or less, 1 Autograph card /10 or less and 1 Base card /15 or less. There’s a chance to pull a fantastic “NASCAR 50 Greatest Drivers” signed lithograph. It was signed in 1999, so has some Greats on it that are no longer with us. There’s also a random appearance of Jack Nicklaus autographs as an added bonus in some boxes. Let’s face it, Five Star is the ultimate high end release when it comes to Press Pass Racing products. As such, you really aren’t too fussed about base. In fact, you probably don’t really want base at all ! Base in Five Star are numbered out of 15. We were lucky enough to pull a Kyle Busch parallel numbered out of 5. Our booklet was okay. We did get a decent driver in Kevin Harvick, but it was a low end /10 booklet with a single color plain black swatch that really has no place being in a product of this caliber. The booklets are nice cards, but Press Pass really needs to do more if they want collectors to buy their high end products. The argument that there will always have to be less attractive cards might work for most releases, but not when the box is $500+ ! All hits should in a product like this should be eye catching. Is there a market for such a high end product ? Seems so as Press Pass say they’ve sold out the release. Personally, while our box was decent, there just isn’t enough to distinguish Five Star from other products such as Showcase which are near a quarter the price. An Auto booklet card in Five Star really isn’t much different from the Auto booklets that have been in the last few Showcase releases. Personally I think what’s missing most from Five Star is innovation and effort. Innopvation in the form of something different in the cards themselves, and effort in making Five Star something so much more than any other release and therefore justifying the very high price tag. Our thoughts are the price point for Five Star is just too high. It should be closer to $350. Thought we’d do things a little different this time. Here’s my first attempt at a video break. Enjoy! Happy New Year! It’s 2012 already! 2012 Press Pass Racing is out and while it’s the low end product for racing fans, the big set and great photography always make it fun to break. So lets take a look..
What you’ll get – 30 packs in each hobby box, 6 cards in each pack. One Race Used Memorabilia card in every box. Auto’s are inserted randomly across the release, but not guranteed per box. Base cards feature a nice clear crisp driver photo, with their name and series they are running in across the bottom. The font used differs between the series, so it’s quite easy to tell a Cup driver from a Truck driver should you ever need to! A number of subset also make up the main set. Front Runners highlight the drivers who have taken the Pole Position throughout the year. Head of the Class highlights the winning drivers of the year and 2011 Highlights funnily enough highlights some miletones that have been set through the year. And to round things off, the Transporters return with their own subset. The overall photography in this set is second to none, and some of the photo’s chosen for the various subsets are pretty fantastic. Maybe it’s all just appealing to the Photographer in me, because sometimes I think we need to get away from all the graphical additions to cards and have photo’s that actually catch the eye with no other help, and Press Pass has done that very well with this release. Check out some of the shots below to see what I mean. Sounds like a lot. But Break them down and it’s not too bad. 10 Gold Parallels – Gold Foil version of base cards. These are un-numbered. 13 Snaphots – Replacing last years Winning ticket, these are a more casual Driver photo on a small card, complete with SP’s to chase – a pretty neat concept! 2 Prereferred Line Inserts – Foil board cards with a full length driver photo and a ghost like image of their car behind them. A little hard to make out the background, but the cards aren’t too bad. The one thing I do hate about them is that they are near impossible to keep clean. Any fingerprints or smudges are a pain to remove, so handle very carefully. We pulled Joey Logano and Dale Earnhardt Jr.
3 Showcar Inserts – Again, a foil card, although the backgrounds are a bit easier to make out on these. The main photo is og the car and the background is of the driver. Kevin Harvick, Kyle Busch and Dake Earnhardt Jr made our box. 2 Showman Inserts – Another foil card, these are essentially the flip of the Showcar inserts with a driver photo and car in the background. With these, there probably wan’t really a need for the Preferred Line insert which is practically the same card, just with a full length driver photo ? 1 Nascar Hall of Fame Insert – This year it looks to be Cale Yarborough and Darrell Waltrip. We got a Cale Yarborough base. 2 Nascar Hall of Fame Holofoil Inserts / 50 – We did well scoring 2 of the scarcer Holofoil NHOF parallel cards. One of Waltrip and one of Yarborough. Now ever since I started collecting NASCAR I’ve been hearing and seeing people pull these cards called ‘4 Wide’ from various Press Pass products which feature 4 different pieces of Race Used Memorabilia on them. They’re relatively scarce as far as inserts go, and I’ve always wanted to pull one of my own. Many, many boxes later and I still hadn’t managed to get hold of one. But with this box, my luck finally changed. Better still it was of a driver I collect. A nice first 4 Wide indeed, getting Mr “Five Time” himself ! The Firesuit swatch really makes the card as it has part of the Firesuit makers logo on it. No Auto’s in our box this time around. You can’t be disappointed in Press Pass 2012, the quality is there, even for a low end set. My only complaint is that it comes out a bit too early to be a full season review (Nov 2011). Couldn’t it be the first release of 2012 that actually comes out in 2012 ? A February release date would have given Press Pass the chance to really cover the whole season. I must admit I have an aversion to products that deliver less cards in a box than I have fingers. I’m also slowly building up an aversion to all things Panini as they drag out an outstanding QA (for a shorted Auto) request from 2010 Absolute into it’s second year, even after I’ve jumped through all the hoops they’ve thrown at me. They really need to take a leaf out of say Press Pass’s book who turned around a QA request in 3 weeks !! That’s not 53 weeks Panini, they did it in just 21 days !! What’s your excuse ? Seems I must be trying to rip off Panini or something, even though until recently I was spending thousands of dollars on their products and have only ever made this one QA request. Maybe if you got it right in the first place Panini, you wouldn’t need to worry about the QA requests ! So if you’re still with me after that mini rant, you’re probably wondering why I bought one of their products ? Well, two reasons. One, it was cheaper than I’d seen it, and two, buying it gave me a reason to have a whinge about their QA Customer Service on here ! 😉 Besides, maybe we’ll have better luck with a Panini product this time….or not. Anyway, on to the Box/pack/tin. It actually comes in a pretty neat looking little tin, although it’s pretty empty in there…. What you’ll get – 5 Cards per Pack, 1 Pack per Box. Box Price Range – Low to Medium $60+ (Average price per card – EXTREME! $12+) The product blurb says there are “Three Autographs or Game Used Memorabilia cards inside” and supposedly you are guaranteed at least one Autograph. Not surprisingly, we got exactly that, one Autograph. Nothing particularly different about these, just a different foil and numbering range. Well, the Kendricks Auto was nice for me as I’m first and foremost a Rams collector, so it’s a nice PC hit. It’s also a nice big white faux pigskin swatch that has allowed a good signature. Somewhat reminiscent of the old Playoff/Threads Hoggs autos from days gone by. The other two cards are just okay, Shannon Sharpe was a heck of a player and Holmes isn’t bad either. That said, the swatches are rather small and both are single color – would have expected more from a five card per box pack, at least one multi color would have been nice. The Sharpe is essentially a sepia toned base card with the swatch added as an afterthought. The Holmes looks like it was built around a swatch, but with a plain white swatch on a very grey card, it’s overall appearance is a bit bland. Add to this the rather dubious aging effect that’s been applied to the bottom of the card which looks more like a printing ink smear than anything else, and the card really starts to look a bit ordinary. I did a Google image search and it seems that this effect is present in all the “Gameday Souvenirs” and always appears in the one section of the bottom edge. It really adds nothing to the card and in fact detracts from the overall look to the point of making the card look faulty. Which begs the question – why bother with it at all? I’m afraid our Timeless Treasures tin failed to impress us at all. 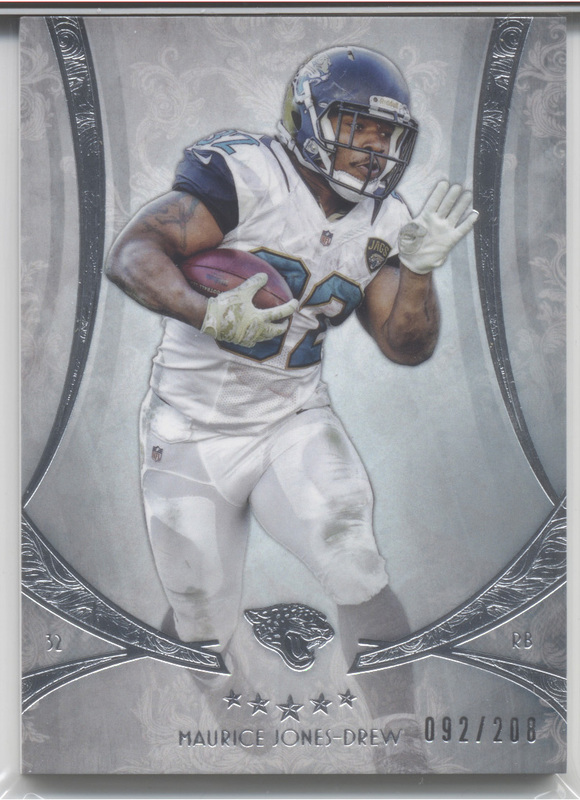 The Kendricks was a nice PC hit, but I’m sure I could have picked it up on ebay as a single for a lot less and I doubt there’s much value in the rest of the cards either monetary or as trade. Pretty sure that better products could have been had for our $60. 2011 Press Pass Legends NASCAR Box Break #2 Fast Pass! After doing well with our first 2011 Press Pass Legends box, I wanted to give one more a go, so it arrived this week and here we are with the results ! You can read of the first break here – https://passing-games.com/2011/11/08/2011-press-pass-legends-nascar-box-break/ but read on as this second break would prove to be something very different ! As we were opening packs it seemed we were seeing more hits than one usually expects. Another surprise was a number of the cards sporting purple foil with lower than usual numbering and this was something we didn’t see at all in our first box. A quick trip to presspassinc.com told us that what we had was a “Fast Pass” box which are seeded at one per case. Extra hits and purple foils. Great stuff! So what exactly did we end up with ? Let’s take a look! Even more parallels this time. The various tiers are /250 Gold, /99 Red and /25 are Purple in this Fast Pass box. 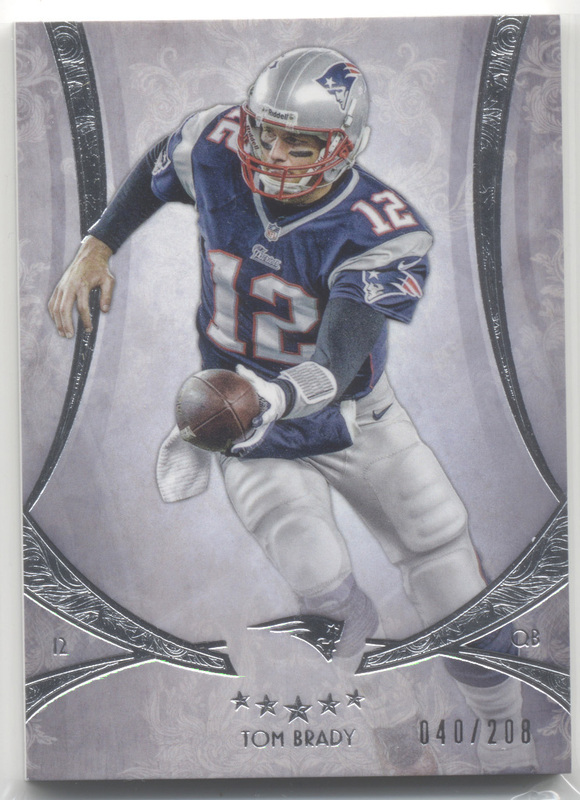 Inserts also come in /199 Brushed Metal and /50 Holofoil parallels. 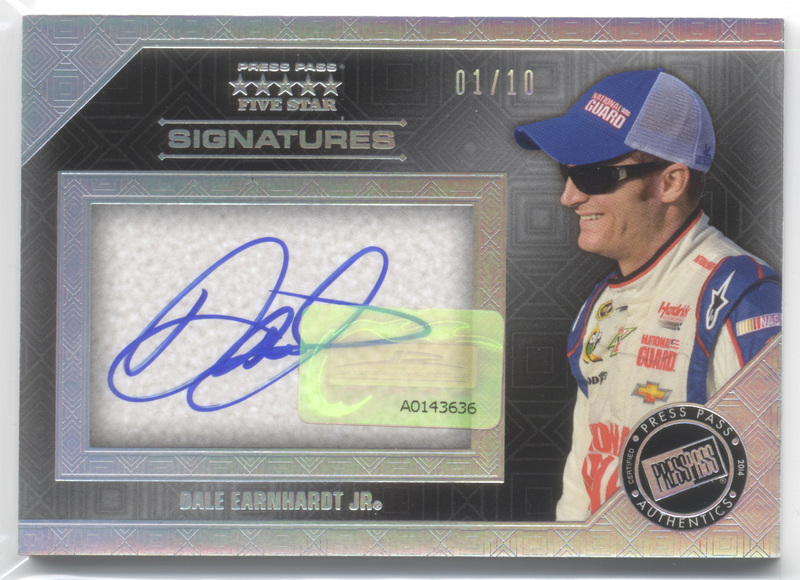 Nice low count PC hit in the Danica and plenty of other interesting cards. Would have preferred a couple more modern drivers in the purples, but I’m not complaining. Not a bad haul at all. And how good are these on card autos ? Gives the signer enough space to do the card justice, if only the other manufacturers would got to the effort that Press Pass does ! A couple of PC hits in the Edwards and Waltrip, but any time you get 9 hits (and a printing plate) is good going. Breaking a box of 2011 Legends is great fun. a Fast Pass box of 2011 Legends is pretty awesome. Lots of hits and low count foils. Our only very minor complaint on the whole Fast Pass thing is that the purple foils are very dark and somewhat difficult to read. Legends has been a very enjoyable release this year, however I wonder if it’s overall popularity will suffer a little with 2012 Press Pass being released only a few weeks after it? Especially with it now being quite late in the year with Christmas approaching, so I’m sure a lot of collectors with limited budgets are likely to find a $65 box of 2012 Press Pass a little easier to justify than the $125 Legends. I really liked last year’s Platinum, so giving this year’s product another go was really a bit of a no-brainer. It shapes up to be one of the years better releases that, while not exactly cheap, does deliver some nice hits, as well as a decent swag of Rookies and a good pile of veterans for an affordable price. The 2011 Platinum base set actually looks a bit better than last years I think. They look a little less metallic and just that bit more subtle, and that’s probably a good thing. Base RC’s are actually all refractors. But then again, the base cards are very refractor like anyway. They’re un-numbered. We did okay with RC’s of 1st rounders Christian Ponder, A.J. Green and Prince Amukamara . That’s a lot of Parallels and Inserts, but it’s padded by the thick bronze version veteran parallel you’ll get in each pack that doesn’t contain a patch card. 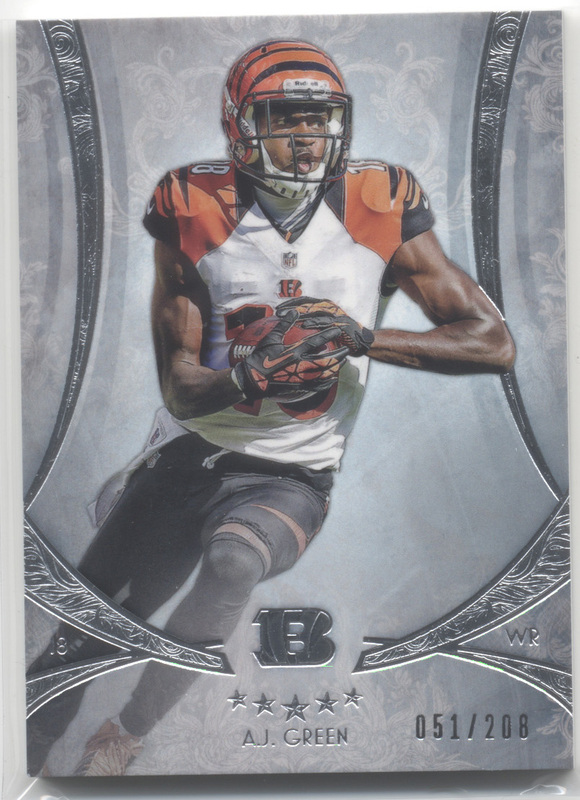 No more Platinum lettering on the thick parallels either, which I think is an improvement on last years release. Not quite sure why the Xfractor Rookies didn’t get numbered along with the colors. Don’t you just love redemptions ? No really, you don’t ?? Of course not, but alas they seem to be here to stay. I’m sure it’s a mammoth logistical nightmare gathering all the signatures back from the players and we can’t delay the release because pick 280 in the draft didn’t send back his cards yet. So us collectors just have to put up with it I guess. We just need to hope that the card makers customer service is up to scratch. Topps haven’t been too bad to me in this regard. One thing I didn’t like about the hits is that they can manage to get the Rookies to sign 1000 on card Autos, but the patch card (which is a nice card btw) that is only out of 356 only rates a sticker Auto ? How much better would the patches be as a display item were the Auto on card ?